Avis is the proud mother to twin daughters Alexis and Alesha. The three have chosen to make the community of Arbor at East Cobb their career home. 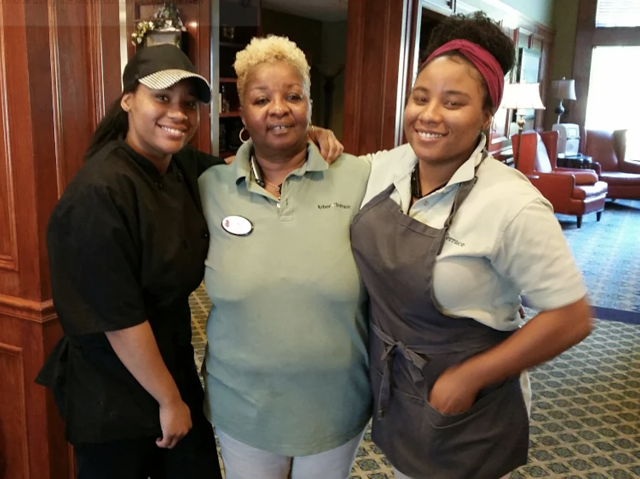 Avis and Alexis are both caregivers in our Evergreen memory care neighborhood, and Alesha is a cook. Hailing from Milwaukee, Wisconsin, Avis served for many years at a VA hospital. She cared for her grandparents and instilled a love of caring for older adults in her daughters. A committed and lifelong caregiver, she has worked with seniors since she was 18 years old. She has been with Arbor for a year and a half. Her daughters joined the Arbor team about a year ago. Avis is proud that her daughters have followed her into the world of caregiving. “It makes me smile every time I see Alexis and Alesha. They are both hard workers and compassionate caregivers,” she remarked. Avis wants families to know that the Arbor community is also a family. This well-established community is home to a caring, stable staff of caregivers who are deeply committed to their work. Almost half of the Arbor team members have been here more than three years. Our executive director has been with Arbor for six years. A committed team helps residents feel comfortable, and consistently reassures them that they matter. You or your loved one deserve a team of caring staff like Avis, Alexis, and Alesha. Arbor Terrace of East Cobb offers a thriving community providing assisted living and dementia care. To learn more about us and our caring, committed team, contact us today.